Chichester Wellbeing is a free, friendly and impartial service that helps people living and working in Chichester District to improve their health and wellbeing by making small, positive lifestyle changes. Chichester Wellbeing has something for everyone. Whether you want advice on getting your family fitter, want to get back into doing some regular exercise, kick a habit, eat more healthily, manage stress or improve your general wellbeing we can support you to do so. Our Wellbeing Advisor will talk things through with you at no cost and discuss the options available to you. We are linked with a wide range of services in Chichester and we will make every effort to ensure that we find something that will suit you. 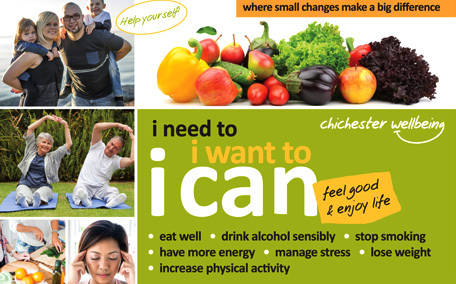 Or have a look at the Chichester Wellbeing website to find out more. We are all different. But regardless of your age, whether you are working or not, or whether you are in good health or if you have a health condition - being physically active is important for you. Chichester District Wellbeing is here to help point you in the right direction for things that will suit you - your own likes and dislikes, your current activity and fitness levels and your lifestyle. Why should we be physically active? Being active will make a difference to the quality of your life. Once you start you'll soon experience the benefits. How much should we be doing? Adults should achieve a total of at least 30 minutes of moderate intensity activity a day on 5 or more days per week. Moderate intensity activity is any activity that leaves you feeling warm and breathing more heavily than usual. The good news is that this 30 minutes doesn't have to be done all in one go, it can be split up into two lots of 15 minutes or three lots of 10 minutes during the day. So if you haven't been active for some time, start off being active in ten minute bouts and then try to gradually build this up over the coming weeks. Any amount of additional activity will make a difference. If you are concerned about your health and how being active will affect you, you should speak with your GP before starting. Most health problems can be helped by regular activity but it is always advisable to check with your doctor first about the amount and type of activity that is suitable for you. For general health benefit children and young people should achieve a total of at least 60 minutes of moderate intensity activity a day on 7 days per week. For more information on staying active as a familyon the British Heart Foundation website. What activity should we be doing? Physical activity doesn't have to mean a trip to the gym. This is great if you like this environment but there are lots of other things that you could do instead. Think about what you enjoy, the time that you have available within your day and what you could fit into your daily routine, the facilities available around your local area and what your friends and families do. Doing things on your own is great but doing it with other people can be even better! Walking in particular is a great source of exercise. It is low impact and costs nothing. You can walk as part of your daily routine - such as walking up stairs, walking to work or school, walking to catch the bus, walking to the local shops or to meet a friend. You can do it on your own, with your family or in an organised group. As a start, just try to fit more walking into your daily routine. From the second you take your first sip, alcohol starts affecting your body and mind. After one or two drinks you may start feeling more sociable, but drink too much and basic human functions, such as walking and talking become much harder. You might also start saying things you don't mean and behaving out of character. Some of alcohol's effects disappear overnight - while others can stay with you a lot longer, or indeed become permanent. Drinking heavily also increases your calorie intake, and it is frequently associated with obesity. This in turn leads to increased health risks. Adding 3 or 4 units per day to your usual diet would lead to an increase in weight of around 4lbs in four weeks. The good news is that the short term effects of drinking are reversible. When you reduce your drinking, the symptoms improve. In the long term, alcohol can contribute to a variety of problems, including damage to an unborn child, liver disease, osteoporosis (thinning of the bones), pancreatitis, stomach ulcers, infertility, heart disease, raised blood pressure, stroke, dementia and brain damage. It can also lead to an increased risk of a variety of cancers, particularly breast cancer and cancer of the gullet. It is also frequently associated with mental health problems, such as depression and anxiety. On the Drinkaware website you'll find useful clinically approved facts and information about the effects of alcohol on your life and lifestyle designed to help you make positive decisions about your drinking. It doesn't matter whether you take it in cocktails, beer, wine, cider or lager, it's the alcohol that counts. Alcohol affects all kinds of cells in the body, causing changes in some and stopping others from working properly. As with most 'poisons', the more you take, the worse the effects are. There are several organisations offering free help and advice, some local and some national. If you are wanting to take the first step but are unsure where to go to first, please either pick up the phone or pop in and see us - we are here to help you. Most people who have alcohol related health problems aren't alcoholics. They are simply people who have regularly drunk more than the recommended levels for some years. There is no guaranteed safe level of drinking, but if you drink less than the recommended daily limit then you will lower the risk of harming your health. Not only people who get drunk or binge drink are at risk, but people who drink more than the NHS recommends may not see the harmful effects at first. Alcohol's hidden harms usually only emerge after a number of years. And by then, serious health problems can already have developed. High-risk drinking if you're a man is regularly drinking more than 8 units a day or 50 units a week. For women, drinking more than 6 units a day or 35 units a week, this amount can affect your whole body and can play a role in numerous medical conditions. The equipment is free, but there is a £10 fitting fee. If you are interested please phone the health visitor at your local doctor's surgery. Often we feel isolated and alone when facing issues such as insomnia, depression & anxiety but we do not have to deal with it alone. 'Stress' has become a word we use everyday when maybe we are very busy, or late etc, and because of this it is not always taken as seriously as perhaps it should. Stress is the way we feel when pressure is put on us and a little pressure or stress can be productive by motivating us and making us more productive. We all act differently to stress and some of us can deal with it better then others. But too much stress can lead to anxiety, depression or insomnia. Everyone experiences anxiety - in fact, being unable to do so can be the sign of quite a serious problem. In our hazardous world, anxiety is a strategy the body uses to help the mind recognise danger and keep well out of its way. Anxiety becomes a problem if it becomes severe and interferes with daily life. If you have a particularly stressful situation in one area of your life this can spread into other areas of your life. Also, if you cannot identify the reason for your anxiety you become anxious about your anxiety and it can start to feed itself. It can also help to get some fresh air every day and not to put things off - deal with issues as they arise. If you are suffering from any of the above issues and have tried all of the useful advice given then you contact your GP, if you have not already done so. Or drop in and see us and we may be able to point you in the direction of further help and advice. There are still some people who think that depression is 'not a real illness'. Depression is a real illness and should be treated as such - but should not be mistaken with feeling fed up or miserable for short periods. Depression interferes with daily life and can last for weeks or months at a time. There are many causes of depression, some of the most common being: stress, anxiety, insomnia, bereavement, physical pain and illness & having a baby (post natal). Depression can affect any age group. If you think you are severely depressed we strongly recommend that you contact your GP. Different therapies help different people and sometimes it may be necessary to try a combination of two, or even a different type of medication before you find one that suits you. If the first therapy doesn't help don't give up on all therapies. Insomnia is simply not getting an adequate amount of sleep. This could be because you are waking in the middle of the night or early in the morning; not being able to switch off, or even over-stimulation. Modern life is a great contributor to insomnia. If you can deal with your anxiety or stress quite often your insomnia will lesson considerably. Leading a full and satisfying life can dramatically reduce insomnia. In some cases it can help to have a pen and some paper by your bed. When you wake and have thoughts that are keeping you awake by writing them down you know you can deal with them in the morning as that way you will not forget your thoughts. If you think changing your eating or physical activity routines could help with any of the above issues please do contact us as we are happy to talk through your options with you. Specific services that we can point you towards to help you achieve your own health goals. (2) Eating a range of foods to make sure you are getting a balanced diet. The right amount of food for you will mean that you are a healthy weight and if you are an adult, that you will maintain your weight at this healthy level. A range of foods should include foods at each meal in amounts similar to those shown on the eatwell plate (see below). A healthy diet contains a variety of food, lots of fruit, vegetables and starchy foods such as wholemeal bread and wholegrain cereals; some protein-rich foods such as meat, fish, eggs and lentils; and some dairy foods. If you would like more information about the eatwell plate or the eight tips to eat well, visit the Eatwell website (see related link). Remember - maintaining a healthy weight is also about how active you are. Most doctors and experts these days use a measure called Body Mass Index or BMI to assess whether your weight is healthy or not. BMI is worked out by a simple calculation for which you need to know your height and weight. You should aim to have a BMI of between 18.5 and 25 to be in the healthy range. It will also mean you are reducing your risk of developing some long term conditions such as heart disease, stroke or cancer. So all in all you will be much more likely to have lots of energy and zest for life. Chichester Wellbeing Home is a new local service, to help keep you warm and make your home more comfortable and more energy efficient. If your home is cold and damp, if you are suffering from health problems, if you are worried about your heating bills, you could be eligible for a Free Home Energy Visit from our qualified energy expert. You may receive free energy saving devices, free practical advice, and free information about keeping warm and healthy in your home. As we get older, keeping active can help you remain independent for as long as possible. Good strength and balance keep you from slowing down, so that you can keep living the life you want. Every year one-third of people aged 65 and above fall over. Hip fracture is a common injury that comes from a fall, and half of those who fracture their hip never return to being as active as they were before the fall. Unfortunately, falls can mean the end of independence for some older people. Keep physically active and do regular exercise in order to improve your muscle strength and balance. Use the NHS falls prevention services. These can help in different ways, including fun and informal exercise groups, advice at home, and foot and bone health assessments. Chichester Wellbeing runs a free WellBalanced workshop which aims to teach people how to reduce their risk of falling, identifying hazards that cause falls, how to avoid them and what you should do if you have a fall. The workshop is an interactive group session that encourages discussion and lasts for around two and a half to three hours. At the end you'll be offered access to a range of gentle exercise programmes led by instructors qualified in falls prevention. Some of the many diseases and illnesses that are directly related to smoking are heart disease, all cancers including lung cancer and emphysema. Smoking can also cause premature ageing. You can get NHS stop smoking support at more than 50 GP practices across West Sussex and pharmacies. To find out which GPs and pharmacies offer support check the Chichester Wellbeing Smoking services . If you would like encouragement and guidance about where to go to first, please contact Chichester Wellbeing, or visit the website to find out what's available close to where you live or work. There are occasions when our home life has an impact on our work. For example, people may be struggling with debt; they could have a family member who is disabled or unwell; dealing with divorce or even an event such as flood or fire. As an Employer what can you do? There are strong links between good health and work. Being out of work can lower self esteem and confidence. Your health can have a direct impact on how well you do your job. If you are feeling happy and healthy you will inevitably do your job to a better standard than if you are feeling stressed or unwell. If you are happy at work you are not so likely to take work problems home with you and therefore you will have a better work home balance. And of course a good attendance record will be something a new employer always asks about. It is not only your employer who is responsible for your wellbeing at work - we all have a role to play. Taking time off work is not always the best way to speed up your recovery. There can sometimes be long term consequences of being absent from work for a long time. Being in work is good for our health. Being out of work is bad for physical and mental health. The longer we are out of work, the harder it can be to get back. Returning to work improves health and can aid recovery from health problems. The health benefits of work outweigh the health risks. Employment advice services have been introduced in some GP surgeries to help people manage financial difficulties including debt problems. Debt counselling or advice from Citizens Advice Bureau can help.